Chuck Nelson and Steel Valley promotions are bringing amateur boxing back to the Palermo Center located in Campbell, Ohio this Saturday, November 11 for the third installment of All-Star Boxing Show. 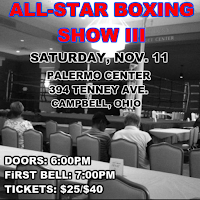 Teaming up with Nelson in promoting the All-Star Boxing series, which will once again showcase 2017 Cleveland Golden Glove champion Ryizeemmion Ford of Alliance, is Chuck Haskell. Fighting in the main event will be Drew Smith of Burnside Boxing, a 2017 United High School graduate and current freshman at Youngstown State University. Brian Simms of Downtown Boxing Club will be in action as well for the first time since defeating C.C. Clark of Pittsburgh by decision on September 30th. Tickets for the event which begins at 7:00 PM with the doors opening at 6:00 PM begin at $25 for general admission. Ringside seats are available for $40. The Palermo Center at St. Lucy's Church is located at 394 Tenney Ave.